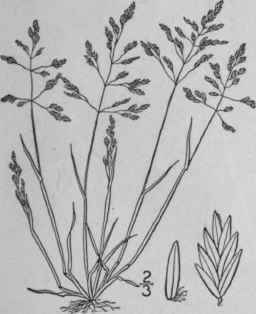 Poa annua L. Sp. PI. 68. 1753. Culms 2'-1° tall, from an annual root, erect or decumbent at the base, somewhat flattened, smooth. Sheaths loose, usually overlapping; ligule about 1" long; blades 2-4' long, 3/4"-1 1/2" wide, smooth; panicle ¥-4' in length, open, branches spreading, 1/4'-1 1/2 long, naked at the base; spikelets 3-5-flowered, 1 1/2"-2 1/2" long; lower scales smooth, the first narrow, acute, 1-nerved, about two-thirds as long as the broad and obtuse 3-nerved second one; flowering scales \\"-2\" long, distinctly 5-nerved, the nerves pilose below. In waste and cultivated places nearly throughout North America. Naturalized from Europe. Native also of Asia. 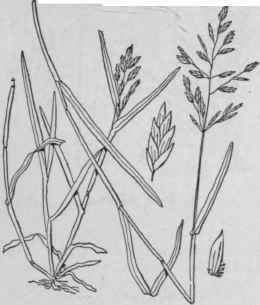 May-, Six-weeks- or Causeway-grass. May-Oct.
P. cristata Chap. Fl. S. States, 562. 1860. Not Walt. 1788. P. Chapmaniana Scribn. Bull. Torr. Club 21: 38. 1894. Culms 3'-6' tall, erect from an annual root, simple, rigid, smooth and glabrous. Sheaths tight, mostly at the base of the culm; ligule 1/2" long, truncate; blades 1/2'-1' long, 1/2" wide or less, smooth; panicle 1-2' in length, the branches usually erect, sometimes spreading or ascending, 3/4' long or less, naked at the base; spikelets 3-7-flowered, 1 1/4"-1 1/2" long; lower scales about equal, 3-nerved, acute; flowering scales webbed at the base, obtuse, 3-nerved, sometimes with two additional obscure nerves, the prominent ones sometimes pilose for three-fourths their length. In dry soil, Virginia to Iowa, south to Florida and Mississippi. April-May. Poa abbreviata R. Br. Bot. App. Parry's Voy. 287. 1824. Culms 6' tall or less, erect, simple, smooth and glabrous. 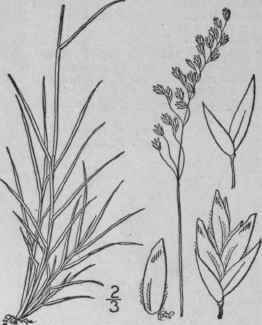 Sheaths and leaves crowded at the base of the culm; ligule 1/2" long; blades 1/2'-1' long, 1/2" wide; panicle contracted, 1/2 - 1' long, branches very short and erect; spikelets 3-5-flowered, 2 1/2" long; lower scales acute, smooth and glabrous; flowering scales about 1 1/2" long, obtuse, strongly pubescent all over, the intermediate nerves very obscure. Arctic America from Greenland and Labrador to the Pacific. Summer. P. laxa Haenke, in Jirasek, Beob. Riesengeb. 118. 1791. Smooth and glabrous, culms 1° tall or less, erect, simple. 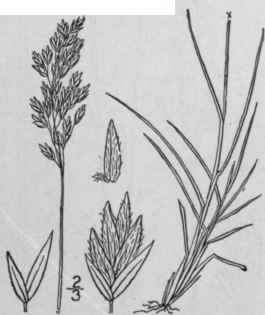 Sheaths often overlapping; ligule about 1" long; blades l' - 3' long, \"-\" wide, acuminate; panicle 1'-3' in length, the branches usually erect, sometimes ascending, 1' long or less; spikelets 3-5-flow-ered, 2"-2 1/2" long; lower scales usually 3-nerved, acute, glabrous, rough on the keel at its apex; flowering scales l 1/2"-l 3/4" long, obtuse, 3-nerved, or sometimes with an additional pair of obscure nerves, the midnerve pilose on the lower half, rough above, the lateral ones pilose for one-third their length. Greenland to Alaska, south to the high mountains of New England and New York. Also in Europe and Asia. Summer.